I have some really incredible memories of Turtles in Time. It was a favorite of mine, and several of my friends, in its arcade version. Even better was the adaptation for the Super Nintendo. Hours and hours were spent throwing Foot clan members at the screen, dodging wrecking balls, and shouting "Cowabunga!" 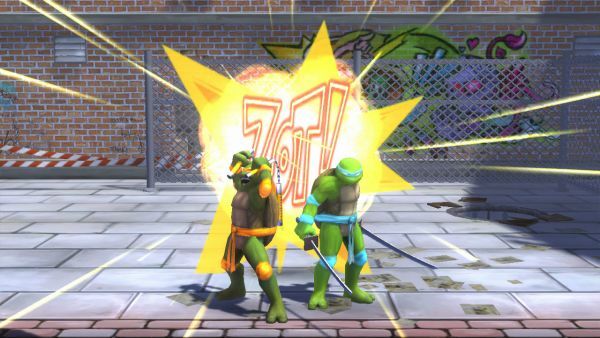 When I learned that a Turtles in Time was being released for XBLA, with a graphic overhaul, to boot, I was thrilled. I found myself quite pleased with the game, but there are a few problems that keep Reshelled from totally kicking shell. First, though, let's talk about what is done right. The game is a treat, visually, for one thing. 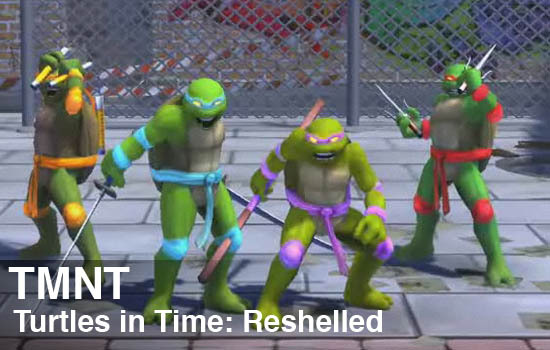 The animations for the turtles are clearly derived from the original, pixelly versions. However, they are smooth and look very appealing. The backgrounds are clean and crisp, and the enemies are nicely translated. I found the art style a bit darker than the classic version, but perhaps those glaring, almost neon colors would have been grating when rendered in true 3D. The music is not the same as the original, which is unfortunate. The sound effects have been redone, with voice acting by the cast of the more recent TMNT cartoons. "My toes, my toes!" sounds quite amusing in four different voices, I assure you! While the gameplay in Reshelled is still basically the same, there are a few nice, unobtrusive tweaks. The biggest change is that players can move and attack in all directions. This is certainly different from the original, but still, it feels quite natural and adds a bit of depth to the (admittedly) repetitive gameplay. This newfound mobility was most evident when fighting the first, flying boss, Baxter Stockman. It was much easier to get in range in the right plane to damage him The turtles have each been given a unique second attack, too, which is generally most useful when surrounded by enemies. I found the second attack to be extremely helpful when the Foot clan overwhelms your poor turtle. 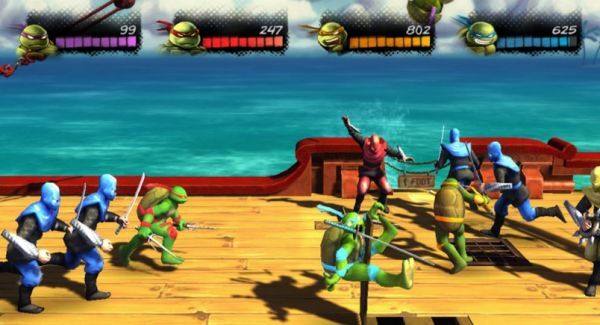 As for the co-op, four players can control a turtle, all at the same time. You can mix and match local and online players as you like. Drop in/drop out is missing, which was a real head scratcher, as it was included in both the arcade and SNES versions. This is quite a shame, especially felt when we played random matches online. There is no way to replace players who drop out, so if you want a full crew, you must restart. You'll definitely want to play with as many friends as possible, as the game doesn't scale in difficulty. Apparently, it is tuned for a full four turtle team, because we had quite a bit of trouble playing with just two. Adding to this problem is the lack of continues. Once you are out of lives, that's it. Playing Reshelled on easy gives you 9 lives, normal 6, etc. I really don't understand the lack of continues. This game is based on the arcade version, where a continue was just a token away. I realize allowing continues makes the game easier to beat, but really, who cares? Make the achievements only kick in when you don't use a continue, if you must. But for a game that is high on nostalgia and replay value, the lack of continues is puzzling.